In light of the events of January 19, we felt it appropriate to issue our own letter asking for your response to some urgent questions. We are citizens of this community—students, faculty and staff—demanding answers for the troubling events of last Thursday. Whose decision was it to militarize an unarmed, nonviolent protest on our campus on January 19, by calling in police in riot gear to threaten and assault a crowd of protesters who continually insisted loudly that their protest was intended to be peaceful? Who decided that this peaceful protest was an “unlawful assembly,” as the police repeatedly announced over the PA system? On what basis was this determined? Why did you (or whoever else was responsible) not come out to address the crowd and explain this decision? Did you hear them chanting, “Tell us why”? What makes a large crowd of dissatisfied people demanding dialogue with their representatives on their own campus an “unlawful assembly”? And don’t those whose actions are unilaterally deemed “unlawful” deserve an explanation as to why? 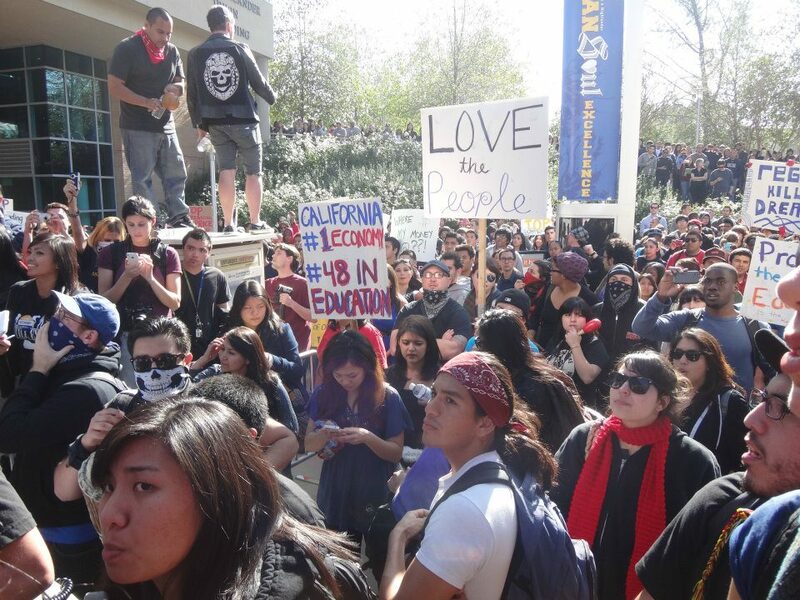 If, as you acknowledge, the actions of that small group of students were nonviolent, why and how would the actions of a handful of disruptive students cause the entire protest to be deemed “unlawful assembly” and justify the threat of force and arrest against all of the other students and faculty members gathered? Why has nonviolent disruption, assertiveness and defiance been equated with aggression, violence and threat on our campus, when Gandhi himself called for nonviolent disobedience to be forceful and confrontational, and when, from a first amendment perspective, “disruptive” and “dangerous” are two very different things? You say in your most recent Friday letter that you needed to “use our police to ensure the safety of meeting participants as well as the majority of protest participants.” But is there any evidence that any of the protesters were threatening the Regents, rather than simply using disruptive—and potentially embarrassing—tactics to make their demands visible? Even if it is still true that police presence was required, why did the police have to be armed with violent equipment, as though they were facing dangerous criminals? Could they not simply have been sent to observe and monitor the proceedings; why did they have to be armed to the hilt, and then escalate the situation with the threats and use of potentially lethal force? Who, in this situation, was the real “threat” to our campus’ security: a group of dissatisfied but unarmed students and faculty chanting “peaceful protest!”, or a group of highly-armed police threatening to and willing to use force through batons, tear gas and rubber bullets (which have been known to kill people in other conflicts)? How can rubber bullets and batons be considered a justifiable response to disruption and embarrassment that is not in any way physically dangerous? What evidence do we have that it was the protesters, and not the highly-armed and militarized police force, who escalated the violence? What accounts for the tight, 1-minute so-called “comment period” provided at the Regents’ meeting? Students and faculty were demanding an open forum that was NOT controlled by the Regents’ own inadequate vision of what constitutes democratic dialogue and transparent decision-making. In light of this, why should their demand to be heard at such a forum be construed as a threat, justifying such escalated violence? When fully-armed police are sent in to threaten, shove and physically assault unarmed people who are already frustrated, resentful and angry at being criminalized and having lost their voices, will this not inevitably escalate the level of violence? So, in conclusion, Chancellor White, we are seeking answers for what happened on January 19, but are also deeply concerned with the implications of these events for the future of free speech on our campus. What makes a crowd of unarmed, peacefully dissenting people “unlawful” and “dangerous”? Who gets to decide, and on what basis? And, what forms of free, nonviolent speech and expression of dissent can be considered “lawful” on our campus, so that they are not met with met with exaggerated militarization, and the escalation of institutionally-authorized violence? The crowd chanted, “Tell us why! Tell us why! Tell us why!” It was an honest request. Our campus is “docile” by some standards. We don’t have Berkeley or UCLA’s history of activism. A lot of our students commute, which means that our campus environment is less condensed, less volatile. UC Riverside is an open campus – perhaps the most open in the University of California system. Parking is relatively cheap and easy. Our students are so diverse it’s hard to imagine what person would think, “this campus doesn’t represent me.” If Berkeley and UCLA are often the sites of large protests it is partly because those campuses represent the system – participating in an action there has a unique symbolic function, as those campuses are “flagship” campuses. The people coordinating the Regents meeting seemed surprised by the size of the crowd, and by its persistence. The UCPD and the administration’s confusion struck a lot of us as dangerous. When the UCPD declared our demonstration an “unlawful assembly” it implicitly announced its intention to use force to break up the crowd without seeking another way to address the situation: negotiation of an exit for the Regents. With a negotiated exit the Regents risked not violence, but the embarrassment of being shunned. The UCPD found their chance, though – as the crowd regrouped at the back of the student center, they used force to prevent the formation of another blockade. Later, they would describe the attempt to form a barricade as violent. When the protesters went to move barricades (again, as they’d been doing all day with no interference), it was not an act of violence. There was nothing threatening about it – the threat was that the activists were going to successfully block the street. At this point, people were shoved to the ground, dragged across the pavement and plastic pellets were shot at the crowd. I saw wounds left by these pellets on students I’ve seen in my own classrooms. The UCPD threw people to the ground, the UCPD shot their new pellet guns into the crowd, the UCPD used force on us. There is ample video out there showing this. By this point, I should add, people had been peacefully protesting for hours – at any point the UCPD or the campus administration might have sought another path by engaging us in dialogue. The next day: UC administrators organized an Orwellian campaign to represent the violence of that incident as caused not by the UCPD but by the protesters. Even more bizarre was the eagerness for the administration to blame not students, but the public – as if the two should be distinguished from each other. In his weekly letter to the campus community Chancellor White claimed that “the disturbance of a few individuals” ruined the demonstration, and that they did not represent the “non-violent students and community members engaged in peaceful protest and exercising their right to free speech.” (January 20, 2012) But the people beaten and shot at by the UCPD are our students; they are our colleagues. And they are our neighbors. We were all in it together. They are the public, and the public is us.